In daily life you may use Voice Memos app on iPhone to record a mysterious sound, an inspiring speech, a melodious song, or even an important meeting. What you record probably are some important information, yet you might lose them due to some accidents such as misoperation, iPhone broken/lost, or iOS update/jailbreak. To deal with those situations, here provides you two methods to recover deleted voice memos from iPhone X/8/7/6s/6/5s. In addition, there are some tips on how to get voice memos off iPhone. Voice Memos app does a great job if you’re tired of typing word by word on iPhone. After you finished recording voice, if you accidentally deleted it or trimmed it wrong, there are still ways to save it. As a reliable third-party software, Gihosoft iPhone Data Recovery helps users recover deleted voice memos from iPhone easily with the steps below. 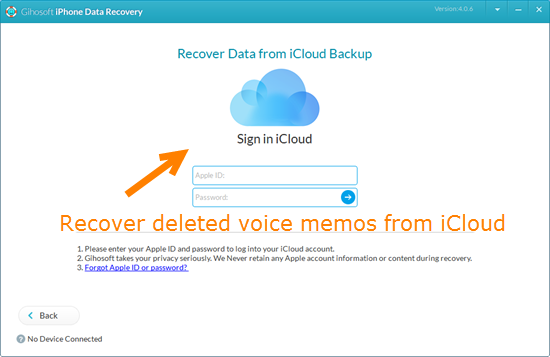 Step 1: Install and run iPhone Memo Recovery tool, and ensure “Voice Memos” is ticked. Step 2: Connect iPhone to computer and scan the device. Step 3: After scanning, preview the result and recover voice memos from iPhone selectively. If you have a good habit of regular backup, then besides your iPhone, you are also able to retrieve voice memos from iPhone backup. There are always risks of erasing all your iPhone contents to restore backup; hence Gihosoft offers two ways for iOS users: extracting voice memos from iTunes backup or iCloud backup. Step 1: Run iPhone Voice Memos Recovery and click Next. Step 2: Choose “View iTunes/iCloud Backup” accordingly, but don’t plug in iPhone. 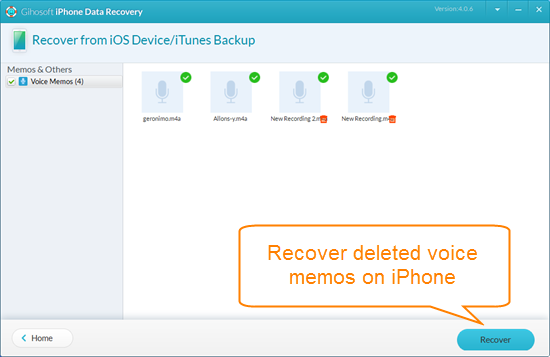 Step 3: After scanning, you can recover deleted voice recordings from iPhone backup. Or you can fully restore iPhone from backup after you confirm that it saved the deleted voice memos. The iPhone Recovery freeware also can be used to freely transfer voice memos from iPhone to computer. You can directly extract current voice memos from iPhone, iTunes or iCloud with the same steps mentioned-above. Besides, you can use the iPhone Recovery software to recover deleted iPhone messages, contacts, photos, and other lost data. Powerful data recovery software to recover deleted photos, videos, contacts, SMS, WhatsApp, notes, etc. from iPhone/iPad/iPod touch.